Here in the Pacific Northwest, the summer drought usually draws to a close round about the middle of October, giving way to the interminable drizzle of the Cascadian monsoon. 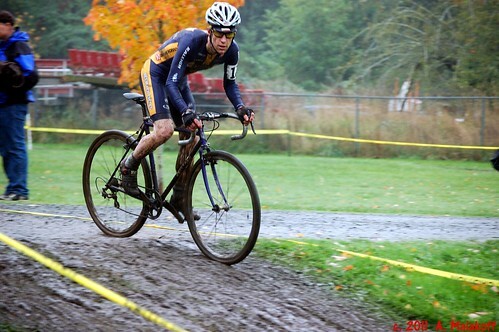 That’s when the cyclocross season really starts jumping – and slipping and sliding, as the rains slicken the grass and coagulate the summer dust into oozing bog. 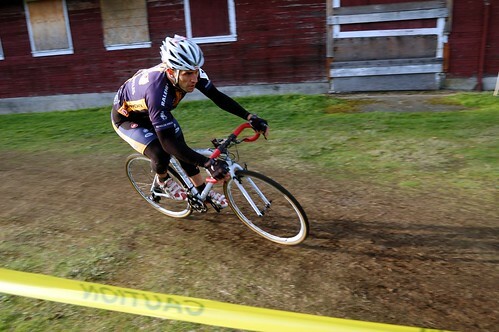 It was the eve of All Hallows Eve when Washington cyclocrossers reconvened at the King County Fairgrounds in Enumclaw WA, where the mountain mists meet the valley, as the fourth event in the Seattle Cyclocross series got underway on day two of a weekend double-header, following the preceding day’s MFG series race. 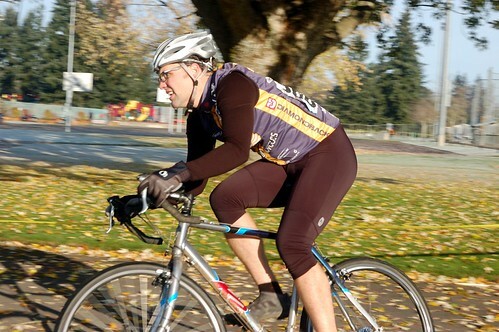 Some racers showed up in scary costume, others wore the regular lycra clown suit. The day began and closed in rain, interrupted only when an evanescent parting of the clouds allowed the mid-morning sun a brief look-see on the proceedings. 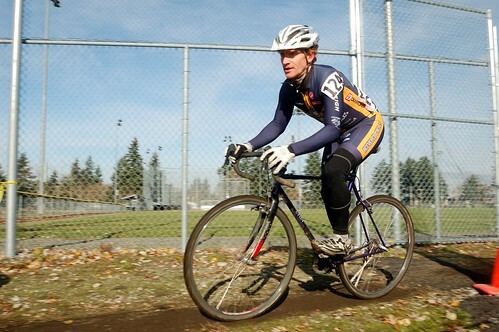 Dan Norton, the Father Time of Washington cyclocross, laid out a true cyclocross course of turf and tarmac: sinuous lines through a grassy field led to an leg-sapping trudge up a near-vertical bog to one of the day’s two beer gardens, where a single-track through the woods led to a muddy fire-road that curved down into soupy flats. Following another excursion through the fields and into the woods, riders emerged from the trees to find themselves headed onto a steep off-camber embankment where the unwary might find themselves veering down the slope into the side of the neighboring football stadium. Opportunities for close encounters with the ground abounded as the course continued through mud and grass with some more tight turns and treacherous off-camber. 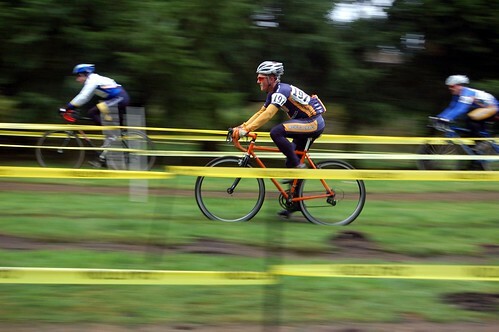 A set of barriers forced a dismount in front of the other beer garden, and the lap concluded with a long grassy straightaway around and through the animal barns. The RCR van with Ali at the wheel showed up in time to claim the last course-side position, and Jamie, Dave, and Andrew hustled to get the tents up, spurred on by the precipitation. 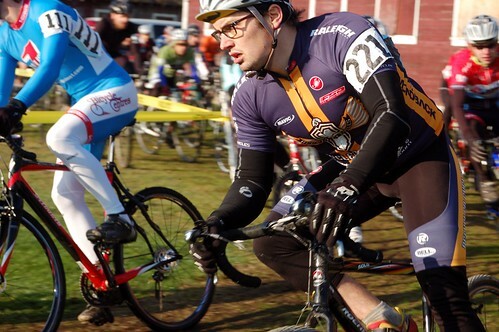 It would turn out that we were right by one of the prime fall-down spots on the course, where oxygen-deprived contestants seemed unable to recall the correct line from one lap to the next. The weather, the travel time, and the previous day’s effort combined to reduce all the day’s field sizes. Nonetheless, the Recycled colors had representation in most of the day’s events. 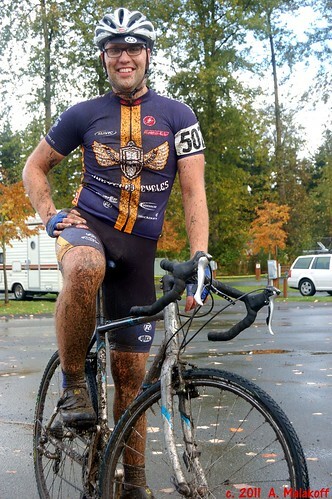 Recent cx initiate Dan spent his day off from his Recycled Cycles wrenching duties getting to know mud with the open Cat 4 field. Taking the start with the Cat 4 35+ masters, Rob continued his season’s progression with a steady ride into the top half of the field, before climbing off his bike to take over grillmaster duties, throwing down some sliders and links from our meat sponsor Bill the Butcher, purveyor of organic all-natural meat products from locally-raised grass-fed livestock. As Rob tended to the grill, his six-year-old dynamo, Thomas, was discovering warm-up and wind-trainers as he got ready for the tots-and-trikes competition. 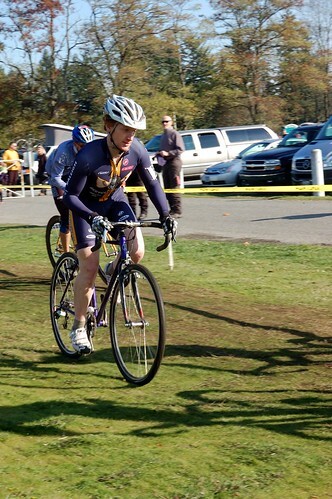 In the noon-time elite race, conditions played to Alex’s strengths as a bike-handler as he avoided mishap and negotiated the field to a solid 7th place. 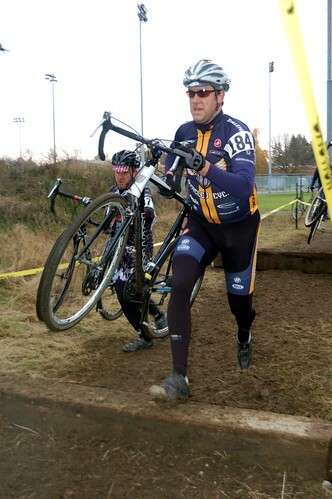 The day’s carnage concluded as four Recyclers joined the open Cat 3 men for a last gallop through the mud. From the shelter of the team tents, we saw Nick A go running by towards the service pit after a flat; Nick B paid for his previous day’s top-10 with a sub-optimal day as well, but retains his 4th place in the scx series overall classification. 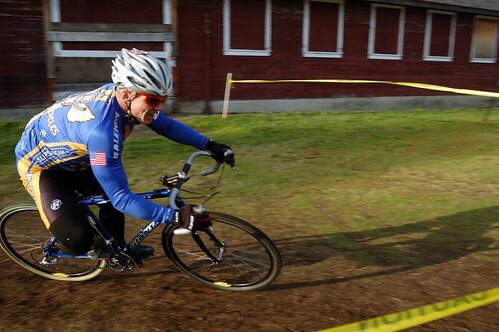 Carl and Jeff showed up to duke it out with each other at the blunt end of the race, with Jeff managing a stealthy comeback to nip Carl at the finish line. 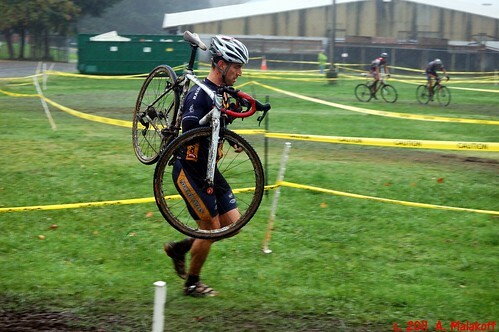 As someone once said, a cyclocross race is like beating your legs with a rubber hose under a cold shower: it feels so good when you stop. 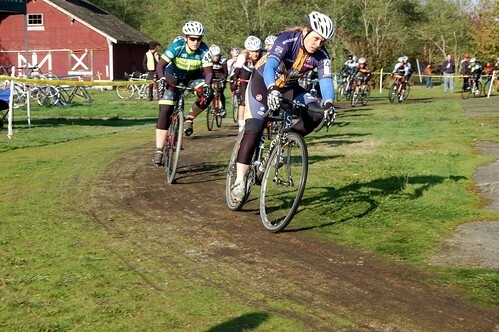 But we’ll be back next week for Seattle Cyclocross #5 at Fort Steilacoom park, south of Tacoma. 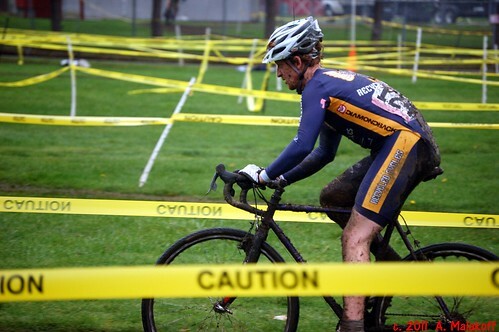 As always, we’re grateful to our outstanding sponsors: Recycled Cycles; Raleigh Bicycles; Schwalbe, FSA, and Bill the Butcher.